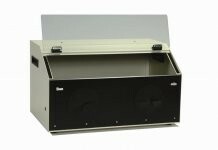 Airbrasive® Work Chambers, also referred to as an abrasive blast cabinet, have been specially designed to assist in hand-held work. Made from enameled steel, our Work Chamber’s can be used with all Micro Abrasive Blasting Units and easily attached to our Dust Collectors. These units feature tempered glass, hinged safety lid, internal illumination, screened flooring, and drop-down front panel for handling larger parts. Working access is through two front portholes.